ArchDaily featured this house last week and remodelista must have followed the bricault design link, because they ran a rather uninteresting picture from the site in an article about green kitchens earlier this week. As usual, you found the most worthy detail to comment on. In my mind, two untold and potentially interesting stories have been neglected. First, how did a small Canadian design firm get the nod and manage to build such a prototypical (goofy) Brooks Avenue Venice Beach icon? Are they relatives? Were they at school together? Is an ex-boyfriend involved? Did they find them in a magazine? Was someone vacationing in California? In Canada? I feel like yelling, "Now get back on the street and get me some answers!" Of course, I'd have to have a big cigar and a messy desk to make that work. Also, we'd have to be under deadline. The other thing is the koi design itself. Was it specifically the architects' design? The owners'? Was it the product of a local artist? Is it based on something? 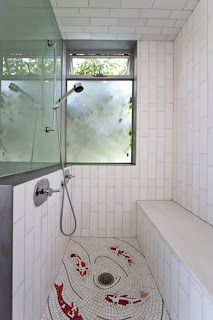 A quick Google of koi shower tile designs convinced me how painfully bad this field can be. And yet... This shower is perfect. I have a friend who hangs out in Venice. I'm going to email a request that she find the house, knock on the door and get to the bottom of this. I hope there's really a story there. Years ago, we lived on Brooks Avenue in Venice—in a blue house across from a Christian Science church. It is, most definitely, a street of many stories. And in a world so small.